The Christel House model includes meeting the social and emotional needs of students. The schools stress parental involvement and support, which is linked to academic success and good behavior in school.4 Character development programming is integrated into all aspects of the schools, with the four core values of Respect, Responsibility, Independence and Integrity as the foundation. These values are incorporated into curricula and modeled daily by students and staff. Community service projects at every grade level teach students to put values into action. Lifeskills education and career guidance programming prepare students for success in life after Christel House. Figure 1: Christel House International Timeline. House put excellent teachers in classrooms. Christel House believes that all students can meet their goals through hard work and appropriate support. All Christel House schools (except Mexico) use English-medium instruction, and the curriculum is rigorous, exceeding local and national content standards. The extended school day and year allow for increased and individualized instructional time. particularly in core subjects. Instruction in visual and performing arts, physical education, computers, and additional languages provides a well-rounded education. Rich extracurricular offerings include sports, dance, band, video editing, robotics, coding, debate, and chess, and contribute to learning and social development outside of the classroom. Students learn the value of giving back to their communities with welldeveloped service learning curricula. In the 2017-18 school year, Christel House students completed over 73,000 volunteer hours around the world. Christel House facilities are of higher quality than those of local public schools. Students receive educational materials free of charge, including school uniforms, textbooks, and classroom supplies. Classrooms are well-equipped and students have access to computer labs, libraries, well-stocked music and art classrooms, sports facilities and indoor cafeterias. School resources such as these can be linked to student learning in developing countries.6 By exposing students to a quality environment and setting a standard of excellence, Christel House shows students what can be achieved through hard work and perserverance. Funding and Cost Structure The operational structure and financing for each Christel House Learning Center depends on its location, but to a greater or lesser degree all depend on charitable donations from corporations, individuals, foundations, governments and the Christel House Founder to support programs and services. Thanks to the Founder’s generosity in assuring that general and administrative expenses, including fundraising costs, are covered from other sources, donors are assured that 100% of their contributions provide a direct benefit for the children. For the 2018/19 fiscal year, Christel House’s budgeted cost per pupil (“CPP”) averaged $7,519 including the U.S. charter schools. If U.S. schools are excluded, CPP drops to $4,283. The CPP by center along with comparable private school tuitions and local public school per pupil expenditures, are detailed in Figure 3 (all in U.S. dollars). 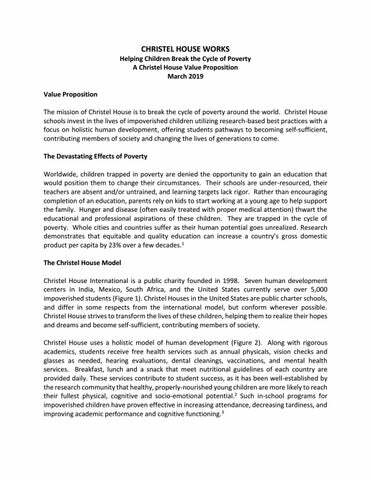 Although the public expenditure per pupil falls below the Christel House cost per student in every country except America, public schools do not provide for comprehensive human development, nor do they achieve comparable results. 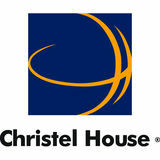 Christel House has proven that its significant investment in this model transforms the lives of impoverished children. This benefit will inure not only to current students but also future generations. The results discussed below bear this out. In summary, the improved academic attainment, reduced rate of grade repetition and lower dropout rates make Christel House a highly cost-effective investment.18 Considering this, a case can be made that producing a Christel House graduate costs less than the cost to produce a graduate through the public school system. student. Data from Project Prometheus Report, Deloitte, September 2016. The three American centers, two of which are traditional K-12 (one opened in 2014 with K-2 and is adding one grade per year) and one of which is an adult high school dropout recovery program, operate as inner-city public charter schools in Indianapolis, Indiana. The schools receive most of their funding from the state and federal government; however no funding is provided by the state for transportation or capital expenditures. Any student can apply for admission to these schools. If requests for admission exceed available seats, entrants are determined by a lottery with preference given to applicants who qualify for the federal free or reduced lunch program. In 2018, 91% of students at Christel House Academy South and 98% of students at Christel House Academy West qualified for this indicator of poverty. The Results Despite serving severely impoverished students, Christel House achieves impressive results, with its students often outperforming national and regional counterparts spanning all income groups. In the 2017-2018 school year, Christel House schools averaged 96% daily K-12 attendance, with 96% year-to-year retention, and 93% cumulative retention20 99% of Christel House secondary students passed graduation exams. Out of 965 College & Careers participants, 92% are continuing their studies or working (in or out of the home - Figure 5). Figure 5: Christel House K-12 graduate College & Career (C&C) outcomes, based on most recent activities of active C&C graduates. university are employed at companies such as Dell, IBM, HP, KPMG, Deloitte, Northern Trust, Wells Fargo, Accenture, and EY. In Karnataka, the state where Christel House Bangalore (CHB) operates, only about 34% of students who enrolled in elementary school in 2004 continued through to grade 12, and just 19% actually graduated: this represents a loss of over 870,000 potential graduates for this cohort.21 At CHB, which serves 857 K-12 students, about 84% of students enrolled in elementary school remain with Christel House through grade 10, and 65% graduate from CHB in grade 12. Many students lost between trade 10 and 12 chose to pursue different course specializations at other high schools, so 65% underestimates CHBâ&#x20AC;&#x2122;s true cohort graduation rate. For as long has CHB has been graduating students, its students have performed well above the provincial average for passing the 12th Grade Board Exam, which is required for graduation. For example, in 2018, 87% of CHB 12th grade students passed the board exam on their first try, compared to only 60% of students from the rest of the Karnataka province. After â&#x20AC;&#x153;re-takes,â&#x20AC;? 97% of CHB 12th graders passed. Not only are CHB students performing above average, but they are competing against more resourced peers, because many students from low socio-economic households drop out of school long before 12th grade. This holds true for the 10th Grade Board Exam pass rate as well. (Figure 6). Figure 6: 10th Grade Board Exam results for CHB, compared to the entire Karnataka province. Students have a chance to re-take the exam, resulting in a higher final pass rate than shown above. In the fall of 2016, Christel House opened a school in Atal Nagar, India. In 2017-18, it served 279 students in grades K-3 and 238 families in this rural area. The school boasts 100% student retention year over year, 96% average daily teacher attendance, and 95% average daily student attendance. Christel House South Africa The quality of education in South Africa lags far behind the rest of the world. A comparison by the OECD ranked South Africa’s education system 75th out of 76 countries.22 27% of students who have attended school for six years cannot read, compared with 4% in Tanzania. About half of the students who have been in school for five years cannot do basic division. In 2015, of the nearly 50 countries assessed by Trends in International Mathematics and Science Study (TIMSS), South Africa ranked at the bottom in mathematical achievement for both fifth and ninth grade. 23 The gap in test scores between the top 20% of wealthiest schools and the remaining 80% is wider than in almost every other country24 Students at Christel House South Africa (CHSA) outperform their peers. 88% of 3rd, 6th, and 9th graders at CHSA passed the Systemic Language Assessment (standardized achievement test for Western Cape) in 2018, compared to a 46% provincial pass rate. 78% of CHSA students passed the mathematics assessment compared to 41% in the province. Historical data attests to CHSA’s consistent high performance on the Systemic Language Assessment results as shown in Figure 7. Higher achievement on Systemic assessments correlates with a higher likelihood to graduate secondary school on time. Only about 39% of South African students who were in 2nd grade in 2007 completed high school in 2017.25 Of the students in grade 2 at CHSA in 2007, 61% completed high school in 2017 at Christel House (and still more could have graduated from other high schools). The cumulative retention rate of all students who enter CHSA is 90%.26 100% of all CHSA students who took the National Senior Certificate graduation exam in 2018 passed on their first attempt, beating the provincial pass rate of 81%. 72% scored a “bachelor pass,” high enough to earn admission to university, beating the provincial bachelor pass rate by 30 percentage points. Figure 7: Pass rates for the Language Systemic Benchmark, CHSA compared with Western Cape province. Average pass rate of grades 3, 6, and 9 shown. Higher graduation rates in turn correlate with better life outcomes. While South Africa faces a staggering youth unemployment rate of 54%27, 96% of CHSA alumni are working and/or continuing their education. Although only 15% of the South African population aged 25-64 has obtained a tertiary degree28, about 44% of recent CHSA graduates have completed or are actively pursuing tertiary education. Christel House Mexico Mexico continues to struggle to reform its educational system. 64% of adults ages 25-64 have not obtained a high school diploma. On average, these adults make 40% less than their peers with a high school diploma. In spite of the correlation between educational attainment and earning, in 2016 only 67% of young adults ages 15-19 were in school.29 The organization Mexicanos Primero found that for every 100 students who enter grade 1 in the public school system, only 45 complete grade 9 on time.30 In contrast, 66% of Christel House Mexico (CHMX) students satisfactorily complete Grade 9 in the expected time. CHMX students achieved impressive attendance and year-to-year retention results as well: 95% and 97%, respectively, in 2018. The most recent results (2015) from the Programme for International Student Assessment (PISA) found that Mexican students ranked in the bottom five of all countries surveyed for science, math, and reading. And, Mexican students are struggling even to meet national standards. In 2018, 60% of 6th grade students across Mexico scored the lowest level on the national standardized test (PLANEA) for mathematics, and an additional 18% scored the second to lowest level; indicating that 78% of 6th grade students in Mexico perform at or below the most basic level expected for their grade.31 In contrast, 86% of CHMX 6th grade students performed at or above competency levels in math, with 63% able to perform advanced tasks for their grade (Figure 8). CHMX students even outperform students from other private schools in Mexico City. The trends are the same for the language and communication exam, where nationally just 18% of students could perform advanced tasks, compared to 52% of CHMX students. Figure 8: Scores of 6th grade students on national standardized math exam in 2018. Level 1 is below basic ability, level 2 is basic ability, and levels 3 and 4 are considered advanced. Figure 9: Comparison of types of diplomas granted between CHA-S and IPS district. Christel House Academy West (CHA-W) opened in 2014 and scored a 100% pass rate on the state IREAD exams (standardized 3rd grade reading test). In 2018, CHA-W students outscored IPS students in the mathematics state exam by 14 percentage points, continuing the trend of outperforming IPS schools in both mathematics and language every year since CHA-W began testing. In addition, CHA-W boasts a 96% average daily student attendance, and a 92% year over year retention rate, and in 2018, 99% of parents attended parent-teacher conferences. DORS is a dropout recovery program that provides a pathway to a high school diploma (not a G.E.D.) for students 18 years of age and older. It operates at three campuses: night classes at CHA-S, and day classes at CHA-W and Ivy Tech Community College. DORS students have the opportunity to be dual-enrolled at Ivy Tech to earn both high school and college credit simultaneously. DORS has enabled 223 students to earn diplomas (Figure 10). DORS-W students had 100% pass rate on the algebra state exam in 2018. In that same year, 100% of the graduates earned dual credits and/or career certifications. Across all campuses, 90% of the graduates participate in College & Careers and 86% are continuing studies or working. Figure 10: Cumulative number of DORS graduates each year. All campuses combined. CHRISTEL HOUSE STUDENTS EXCEL Christel House students finish school. They excel academically, demonstrate strong character and good values, and are prepared to successfully pursue further education or gainful employment. These achievements lead to rewarding occupations with higher incomes that allow Christel House graduates to break the cycle of poverty, attain self-sufficiency, and realize their hopes and dreams. Cumulative Retention Purpose: To determine the rate at which students continue attending Christel House from the date of original admission through current year. It is a measure of the success at retaining every student who enters the school at any time. It only measures the retention of current student cohorts. Once a cohort graduates it is taken out of the calculation. Formula: Total Students in the school at academic year end (including current 12th graders or terminal grade students who will graduate in the current year) divided by the total number of students admitted (including starting grades and all backfills) from and including the original admissions date of the oldest class/grade of students.